It will be an evening of dark, mucky rock at the Turf Club this Wednesday featuring three local groups taking the helm. Svoboda, Flintlock, and Personhunter will be co-headlining an intense night here in St. Paul. Minneapolis sludge rock group Svoboda made waves in the Twin Cities by posting their 2012 demo on Bandcamp. Though five songs long, the group establishes themselves almost instantly as a torrent of emotion and energy with “V.I.T.R.I.O.L.”, which is a slow-burning intro leading into its fury 2 minutes in. They'll be joined by another hard hitting local group, Flintlock, who uploaded their tracks off of Confluence this past summer, presumably their upcoming LP. So for anyone looking to rock out a little harder than normal, all signs point towards Wednesday night at the Turf. Before his Mainroom shows Friday & Saturday night, Dr. Dog will perform in the intimate confines of the Turf Club. Dr. Dog normally performs in far larger venues, so this will be a special night for those who have tickets to this long sold-out show. Dr. Dog has built up a large audience here in the Twin Cities from State Fair performances, Mainroom performances, and their national acclaim. This neo/psych/baroque rock band has been producing instant classics since 1999, and take influence of The Beach Boys and The Beatles, which fits the group well as an original yet popular band. Their earlier days were heavily influenced by indie rock bands Guided By Voices and Pavement. The group has been pleasing audiences worldwide from their several late night talk show performances, being featured on all of the majors. This past January Dr. Dog released their first live album, Live at a Flamingo Hotel, which is not surprise to those who have seen them live, and who are used to their incredible live sets. We'll be hosting some of our favorite local artists this Friday at the Turf to perform songs by some past rock stars, who unfortunately aren't likely to be playing the Turf anytime in the near future. These rock collectives prefer to consider themselves a large bunch of friends getting together on stage, playing some of everyone's favorite tunes from these classic groups (theirs and yours) while you (and them) get to kick back and have a drink. The atmosphere created brings a very laid back feel to what would normally be a packed Xcel or Target Center reunion show. 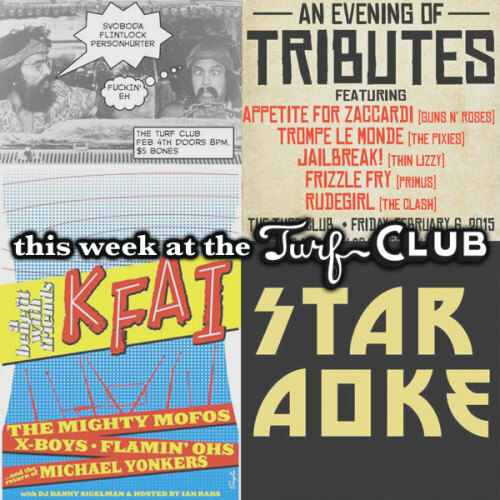 Stop by the Turf this Friday night and hear some of your favorite songs from Guns N Roses, The Pixies, and Thin Lizzy performed by some of the most talented musicians in the Twin Cities. Hosted by Ian Rans and Cyn Collins, we will be having the KFAI Radio Without Boundaries event at the Turf this Saturday night, featuring several local acts including The Mighty Mofos, X-Boys, Flamin' Ohs, Michael Yonkers, and DJ Paper Sleeves. This show contains some of the most variety of genres the Turf has seen in one night. The Mighty Mofos aren't new to the Twin Cities, forming in 1984 and have been rocking ever since with their frontman Billy Batson, and his guitar-playing brother Ernie. The group has been performing in the cities regularly since their inception, and leaving audiences thrilled. In terms of start date, one of the few groups still putting on shows longer than the Mofos has got to be The Flamin' Ohs, who began in 1977. They were one of the first groups to popularize music videos and we are so thrilled to host them both.